The Medieval Times encompass one of the most exciting periods in the History of England and Europe. The names of many famous Medieval women scatter the Medieval History books and other historical documents - they were mostly queens and princesses. But what about the women who were not of noble birth? Who were these Medieval women who became famous despite the dominance of men during this era? The following biography, short history and interesting facts provide helpful information for history courses and history coursework about the key dates and events in the life of Lady Godiva who was famous as the woman who rode naked on a horse through the Medieval town of Coventry. Lady Godiva is mentioned in the Domesday Book which was compiled in 1086. 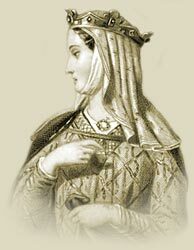 This famous noblewoman is documented as holding many estates in Warwickshire which included Coventry, which she inherited from Leofric who died in 1057. The legend of Lady Godiva dates back to England in Medieval Times when the Saxon wife of a Danish Lord rode naked through the streets of Coventry, 'clad in naught but her long tresses', in order to prove that the Saxon inhabitants were honorable and would not look at her. The story and biography of Lady Godiva which contains interesting information, facts & the history about the life of this Medieval woman of historical importance. The legend and story was embellished as time went by detail was added that Lady Godiva had instructed the townsfolk to stay indoors during her ride, everyone did except a man named Tom who not resist peeking at her, hence the term "Peeping Tom." Interesting facts and information with a short biography about the Medieval Life, Times and history of Lady Godiva. Additional useful details, facts, history, biography, timeline and information about the lives of other famous people of the Dark Ages and Middle Ages, and the important events which occurred during their times, can be accessed via the Medieval Life and Times Sitemap. The content of this article on Medieval life and times provides free educational details, facts and information for reference and research for schools, colleges and homework for history courses and history coursework.